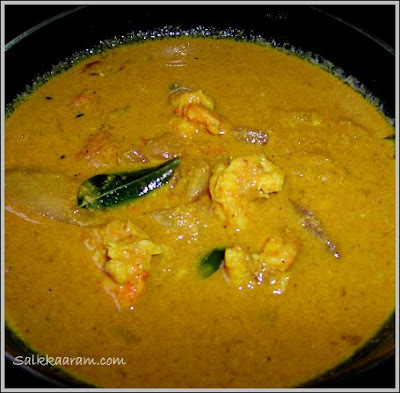 Chemmeen Theeyal / prawns in fried coconut gravy | Simple and Delicious ! Tamarind paste - A lemon size soaked in wateror Kukum star(Kudampuli) - 4 small pieces or as desired Or use raw mango 1 or 2 according to it's sourness. 2)Fry coconut with one pinch fennel seeds, 3 small onions and curry leaves till brown in 1 tsp of coconut oil. 3)Blend it with water. :- Coconut should be grated well. 4)Dry roast all the three powders. 5)Mix this with onion, tomato, crushed garlic, coconut blended, tamarind paste and salt. 6)Add 1 1/2 cups of water. 7)Cook, till the onion and tomato is well done and the curry becomes little thick. 8)Add prawns and cook till done. :- Do not cook too much. It will become hard. 10)Heat coconut oil in a pan. 11)Fry 3 chopped small onions and curry leaves. Pour into the curry. You can roast the powders with coconut (in the end of roasting coconut) and then blend. Make this type of curry with ayala / mackeral, ayakkoora / king fish and other big fishes.. THis theeyal looks very nice. Thanks for sharing a "must-try" recipe. Awesome recipes for seafood lovers. I stumbled upon your blog while goggling for fish curry and I should say I am pleased with the wonderful recipes supported by real good images and clearcut cooking methods. Thumbs up! what a tempting picture...mouth watered seeing that! i am going to try with ayala fish. thanks for the recipe and the photo. all these days i had been thinking we put drumstick with prawns theeyal,that's how i had it earlier from somewhere,i really liked it.wat if i try your reciepe with drumstick,will it be a flop?